Chennai, after Bangalore and Hyderabad seems to have recently undergone an invasion of cold-stone ice cream joints. Personally, being a fan of cold stone ice creams I couldn't miss this one and decided to try it out during my weekend trip home. Benchmarking it to its peers, I feel the ambience is less appealing. But on a standalone judgement they might not fair too bad. The ice cream sandwiches and bars which were stored in the refrigerators did not look inviting. They are priced reasonable and two large sundaes cost us 350 odd. Thats reasonable especially considering the pricing of competitors. The ice creams were served pretty quick. The staff could however be better equipped in guiding customers with the selection; especially considering their extensive offering. 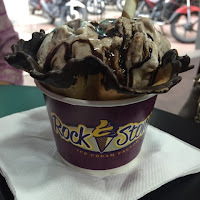 Even though it might not figure in my list of favourite cold stone ice creams, this was definitely good stuff. A complete contrast to the previous order. The ice cream was too sweet and had nothing oreo about it. Would not recommend this order. 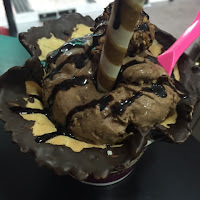 Another competitive addition to Anna Nagar ice creams and desserts scene.